Wider market risk sentiment appears to be influencing the euro vs dollar pair which was once again subject to indecision and trading in a very narrow range. 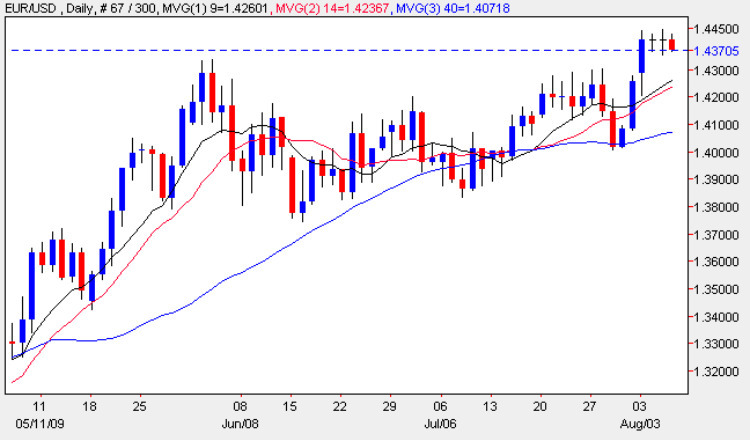 Technically the daily chart ended with a perfect doji cross identical in all respects to that of Tuesday as the market waits for today’s ECB rate decision, followed by the ECB statement, and then looks ahead to the NFP data tomorrow. Having broken out of the strong sideways consolidation this should now provide the platform for an eventual much strong move higher and with all three moving averages pointing upwards our medium term target still remains at 1.50. Any short term reversal (possibly as a result of some loose talk from Jean Claude Trichet) should be viewed as a buying opportunity. All the other fundamental news items on the economic calendar for both the euro and the dollar are covered in detail on the eurodollar site.